One doesn’t usually associate athleticism with a primary first baseman, but Kirilloff—who also plays the outfield—breaks the mold. At 6-foot-2, 195-pounds, Kirilloff has an athletic build and above average foot speed, as he turned in a 6.67 60-yard dash at the National Showcase. 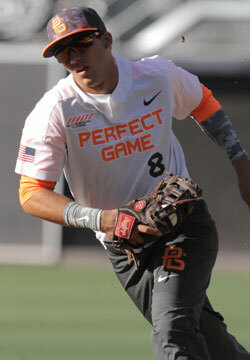 His athleticism stands out in the field, as he is one of the premier defensive first baseman in the class. He’ll do his most impressive damage at the plate however, as Kirilloff has bat speed and the natural loft in his swing plane that is conducive to big raw power.